Ascending Butterfly: What's New at the Zoo? Check out this weekend's happenings at the New York Bronx Zoo! What's New at the Zoo? Check out this weekend's happenings at the New York Bronx Zoo! 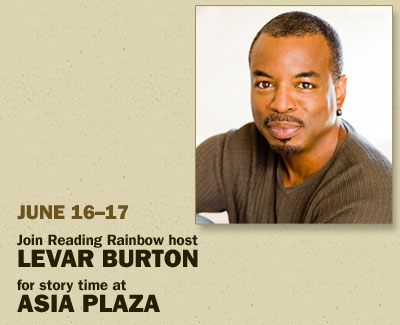 LeVar Burton will be at the Bronx Zoo this weekend for a sneak peek of the new Reading Rainbow app and special book reading! This is a great opportunity to see LeVar and get a sneak peek at the new Reading Rainbow app for the next generation “digital” Reading Rainbow kids. My niece and nephew love Reading Rainbow, and I'm a total nerdie Star Trek fan, so we may have to all head to the zoo this weekend and catch story time at Asia Plaza in the Bronx Zoo this weekend. It's so super cool to have access to one of the city's better known landmarks practically in my backyard! I have to admit the role I most associate with Mr. Burton is as Geordi La Forge from the Star Trek: The Next Generation, television series. Although one of his first claims to fame was for his acting in the television mini-series Roots (the role landed him an Emmy). He has also written a book called The Aftermath. 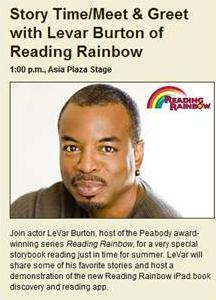 I could definitely go on and on about his achievements throughout his amazing career, but it's his work for Reading Rainbow that will be featured this week at the Reading Rainbow Sneak peek, and if you are looking for something fun AND educational to do with the kiddos this weekend, this would be my pick! LeVar is very personable and has a great rapport with children.